KidStart Magazine > Family Life > Holidays & days out > Keep them entertained this Summer with Argos! Keep them entertained this Summer with Argos! 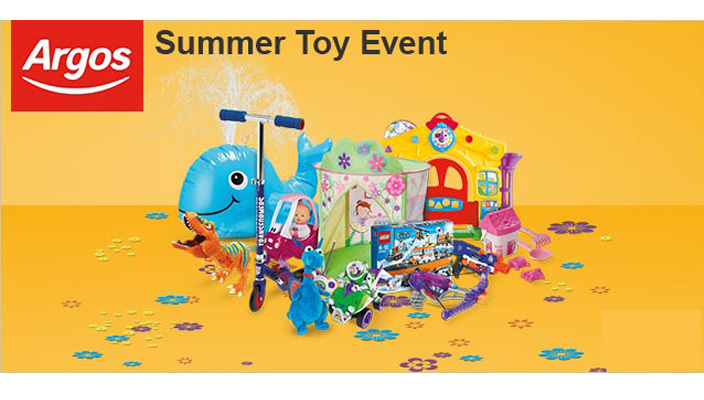 Come rain or shine, Argos has got entertaining the Kids this summer covered! Argos has just launched its’ brand new ranges which means loads of choice on a huge range of products which includes some great new toy ranges! All of the kids are talking about the new Transformers movie, so if you don’t know your Bumblebee from you Optimus Prime, check out the Argos Transformers online shop to find the latest toy range, dressing up costumes and video games. Plus download a free Transformers wallpaper for your computer! You can still pick up some great deals on the outdoor essentials. For those long hot summer days, a paddling pool is an absolute must for hours of splashing good fun! Check out the Disney Finding Nemo 3D Paddling Pool which comes with 2 pairs of 3D goggles so the kids can dive under and find themselves among their favourite Nemo characters! No room for a pool? No problem- why not try out the Chill Factor Squeeze cup Slushy maker – just put in the freezer, wait to freeze then add your preferred chilled drink and squeeze! No ice, no blenders, no mess! It’s so easy to use – you’ll want to pinch this from the kids to cool down! Want to keep them entertained without breaking the bank? Take a look at the mix and match ‘2 for £15’ and ‘2 for £30’ toys which range from the Barbie Princess Styling Head to the latest craze ‘Fun Loom Bracelet making Kit’. These offers are a great idea for presents for all of those summer kids’ parties, or if you just want to spoil your little one! Make shopping with Argos easy by checking online and reserving your product in store today at www.Argos.co.uk and don’t forget to collect 1% back for your kids when you shop through KidStart.